Over the past decade 33 people have died in incidents involving Super Puma helicopters. Offshore union RMT is repeating its call for a full public inquiry into North Sea helicopter safety through an emergency motion at the STUC conference. The union said such an inquiry is essential due to the "ongoing decline in offshore workers' confidence" in the safety of offshore helicopter operations. Over the past decade 33 people have died in incidents involving Super Puma helicopters in UK and Norwegian sectors of the North Sea. 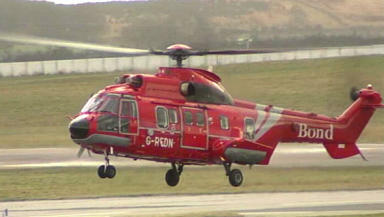 Fourteen oil workers and two crew died when a Bond Super Puma plunged into the water off the Aberdeenshire coast on April 1, 2009. An Air Accidents Investigation Branch (AAIB) probe into the crash found the aircraft suffered a "catastrophic failure" of its main rotor gearbox, while a fatal accident inquiry (FAI) in 2014 found that the tragedy might have been avoided. In the emergency motion tabled at the conference in Dundee on Wednesday, the RMT said that the FAI process does not offer "meaningful safety lessons for the wider industry" and is not an effective means of restorative justice for the families affected by offshore helicopter incidents. RMT general secretary Mick Cash said: "It is nothing short of a scandal that the Scottish and UK governments are opposing the public inquiry that is clearly needed to tackle the decline we have seen over the last ten years in offshore workers' confidence in the safety of the helicopter transport they are required to travel in. "That is why are calling for renewed support from across the Scottish trade union movement for our on-going campaign in Dundee today. "Both RMT and Unite support an inquiry, which would cover commercial pressures brought on operators by oil and gas companies and we now have a significant body of cross-party support, including SNP MPs in Westminster, who have added their voices to this important campaign for a just response to the deaths, trauma and growing safety fears of North Sea oil and gas workers and their families." Eleven passengers and two crew members were killed when a Super Puma 225 aircraft came down near the city of Bergen, Norway, in April 2016 while in August 2013 a Super Puma L2 carrying oil rig workers ditched in the North Sea leaving four people dead. In a statement after the FAI Bond Offshore said it accepted that it had made mistakes and that lessons have been learned and continue to be learned. The motion, moved by Aberdeen Trades Union Council, calls on the STUC congress to write to the Scottish Government urging them to back a full independent public inquiry. A Department for Transport spokeswoman said: "We have given this matter careful and serious consideration, and the Civil Aviation Authority (CAA) has already undertaken a comprehensive review into this matter. "We found that a public inquiry would not achieve anything beyond the assurances already provided by this review, which culminated in a number of significant changes to increase the safety standards of offshore helicopter flights." Paul Wheelhouse MSP, Minister for Energy, Connectivity and the Islands, said: "The offshore workforce's concerns on helicopter safety are a shared priority of the highest order. "While we have no legal or regulatory powers in respect of aviation safety, we have made clear to our industry partners that nothing is more important than ensuring the safety of those who work offshore. "We are very sympathetic to the underlying concerns of the offshore workforce, and have raised specific issues with employers on their behalf. "However, we do not believe a public inquiry into helicopter safety would, at this time, add to the significant streams of work being undertaken by the Civil Aviation Authority, unions, operators and other stakeholders in developing and implementing a range of safety measures to address concerns that have been raised."